Brussels Sprouts. Along with Lima beans, probably the most infamous object of children’s fear and loathing in the food world. I can’t say I hated them as a kid – I never even tried them until I was an adult. And that first time, my boyfriend at the time was a chef, so I loved them. 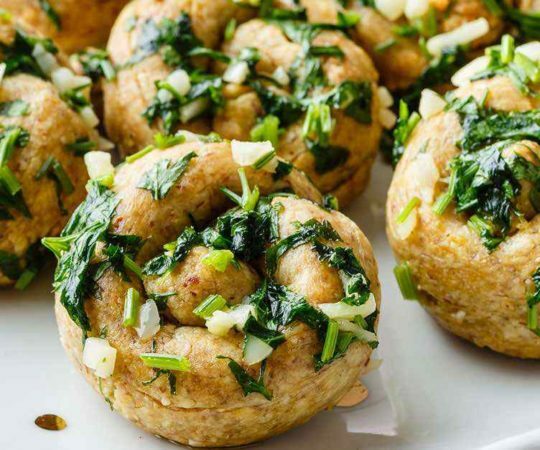 But I never attempted to make them myself until I went all paleo, because I assumed they were difficult to make, or at least it was difficult to make them taste good. I was soooooooo wrong. If you’re not already on the Brussels Sprouts bandwagon, jump aboard, my friend. They are so simple to make – and it’s so simple to make them taste good – that I don’t know why everyone isn’t eating them all the time. I suspect that the traditional hatred of Brussels sprouts may have been a result of boiling to death and a lack of seasoning. I can see how that might result in something less than delectable. But isn’t that true about nearly any vegetable? I don’t want over-boiled mushy broccoli served plain. Ick. But keep it green and a little crunchy and add some lemon and salt and coconut oil? Yes, please! So all I’m saying here is – let’s not blame the Brussels sprouts for some unimaginative cooks. Instead, let’s get those wee little cabbage-head looking things tender on the inside and crispy on the outside and treat them to a sprinkling of wonderful flavors, and *then* see what we think! This recipe does exactly that. The quick (emphasis on “quick”) boiling bath gets them tender to the core. But the baking is where the flavor really gets developed. 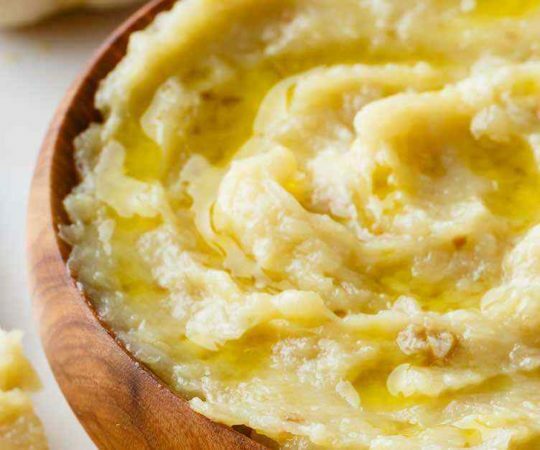 Of course, we add some flavor – the garlic and cayenne – which takes things to a new level, but the actual process of baking creates flavor as well. When a food is exposed to heat and it browns, it’s called caramelization. Basically, it means the sugars in the food you are heating are breaking down. The result is the brown, caramel-like color, and the creation of a rich, nutty flavor. And that’s exactly what happens to your Brussels sprouts as they bake. The outer leaves brown and crisp up, some of them pulling away from the head slightly, and the whole sprout gets this wonderful, warm, nutty flavor. 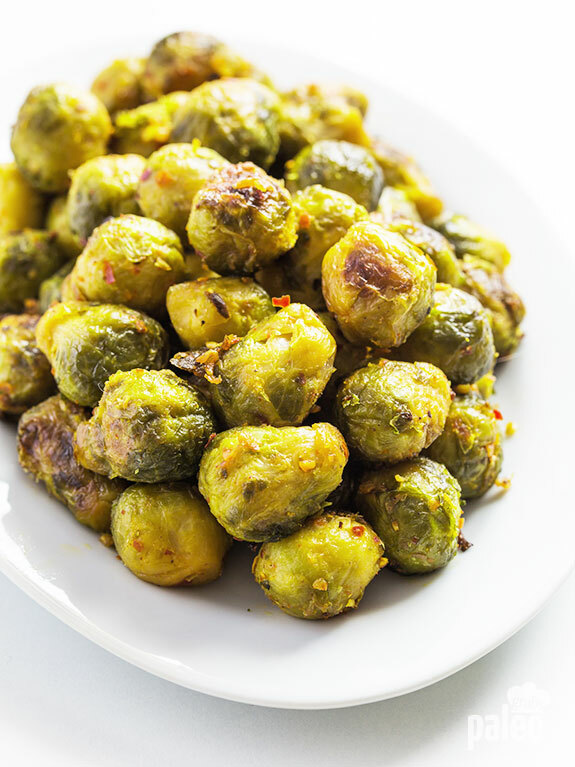 Aside from how wonderful these Brussels sprouts taste, and how easy they are to make, they are good for you. For a vegetable, they have a surprisingly high amount of protein: about 2 grams in a half-cup. They are also packed with iron and potassium and fiber. So when your mom told you to eat your Brussels sprouts, she was right – they’re super good for you! And now you can make them super yummy as well. Pair them with chicken, pork, or beef for a great dinner. Or you can do what I do – make a big batch, have some for dinner, and the rest for a snack the next day! They’re even good chilled, right out of the fridge. Hope you enjoy! Add the minced garlic, cayenne pepper and melted coconut oil and gently toss to coat. 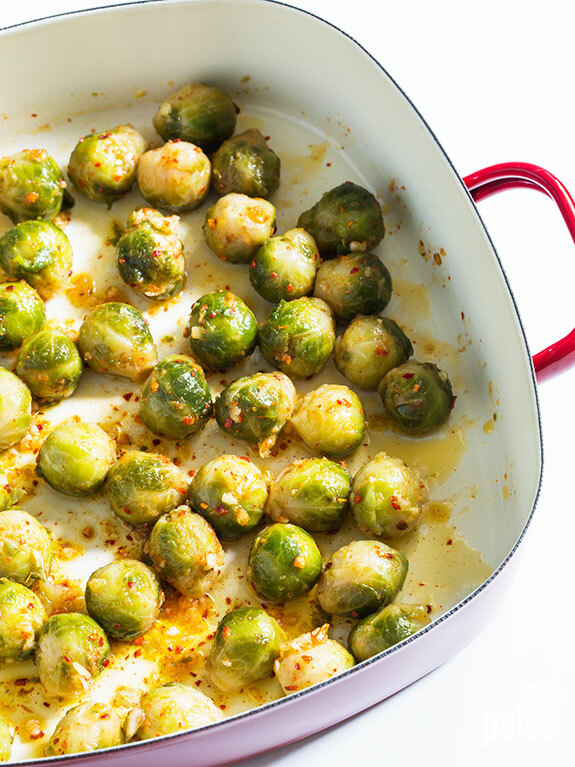 Transfer the Brussels sprouts to a baking pan and sprinkle with salt. Bake for 15-20 minutes, shaking pan occasionally, until sprouts are quite brown and crisp on the outside and tender on the inside. 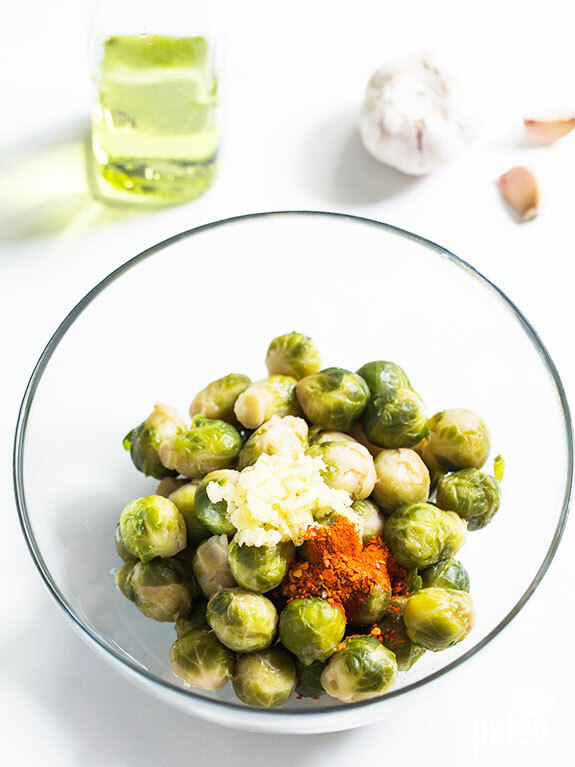 Can’t wait to try this recipe, I love Brussels sprouts, and this is similar to how I make them already, looking forward to the Cayenne addition! I have a question, do you cut the bottom off your Brussels or cook them whole? Oops – I should have said Step 2 is not necessary. Do preheat the oven (step 1), skip step 2 (boiling), then roast in oven (step 3), but for 25-30 minutes since you skipped the boiling. You need to try your recipe in a cast iron skillet, that is how my mom makes them and it really adds to the flavor, My siblings and I have enjoyed these every holiday since we were little and love them, even our spouse look forward to them. Good recipe but instead of wasting the water for boiling just microwave them for a couple of minutes and then roast or saute. Don’t allow your microwave be a pariah! Can these be done with frozen brussel sprouts? If yes, would anything change? I’ve never cooked (or eaten, I think) Brussels sprouts. I bought a bag of frozen ones recently thinking I really should give them a try. This recipe looks right up my alley! Question though… should I thaw my frozen ones before I start this, or just boil them a little longer from frozen? (If these go over well with the fam then fresh ones will be used later.) Thanks so much! I would recommend fresh first before the frozen. I have to say I wouldn’t judge brussel sprouts by trying frozen. Frozen are just ok, fresh are FABULOUS. I make this recipe with frozen, and generally don’t thaw first – just cook in the oven a little longer and they always turn out great! I like to eye ball my spices but try cutting sprouts in half and sprinkle; kosher salt, black pepper, Rosemary, thyme, garlic powder, onion powder, and toss together with a little olive oil. Bake at a 450 degree oven for 20 mins. Delilah!!! 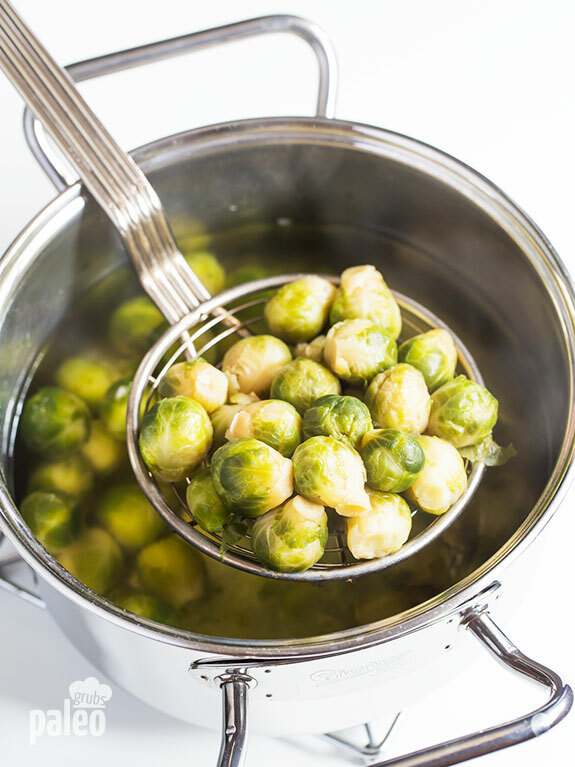 Yes, by cutting the sprouts in half, you can eliminate boiling them. Plus you have more surfaces for browning! I don’t bother with boiling them first. Just cut them in half, toss with olive oil, seasonings, and toss in some pancetta and sliced shallots and roast them at 400 or higher until done. I usually drizzle a little Balsamic Glaze over them and some parmesan before serving. The leaves that fall off are like eating crispy chips. I usually eat those before anyone else see them 🙂 I used to detest Brussels sprouts and now they’re one of my favorite veggies. 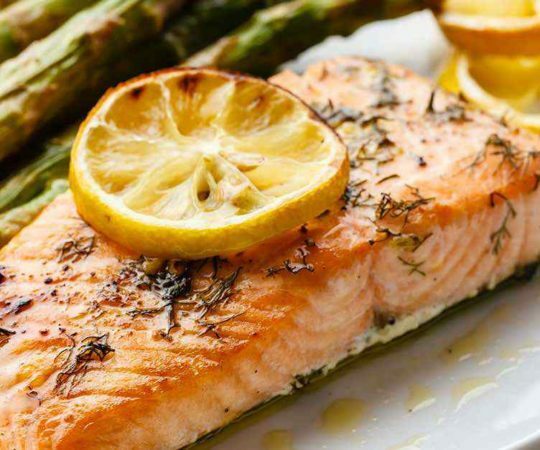 If you’re completely Paleo, skip the parmesan, although a little goes a long way. EXACTLY HOW I EAT THEM. I would never boil them…. I don’t do the Balsamic though. I would not boil them. Better doing it as you described and getting that nice char on them. Having some tonight…. I did this with frozen brussels sprouts, at 400 degrees. Comes out amazing!!! Thanks for the recipe. 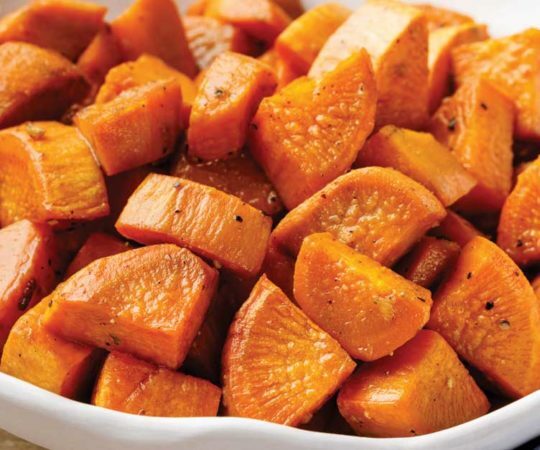 <3 Roasted Vegetables. I am going to try this on my George Forman grill with a small yam and fish. I just got my first George Foreman grill. I like the sound of the yam and fish and Brussels Sprouts cooked on the grill. Can you please share a recipe for how you would do that? Have you ever tried a recipe and thought who was the tester?… they lied!!. I tried this recipe tonight and both my husband and I give it a two thumbs up. VERY GOOD. I will make this one again. 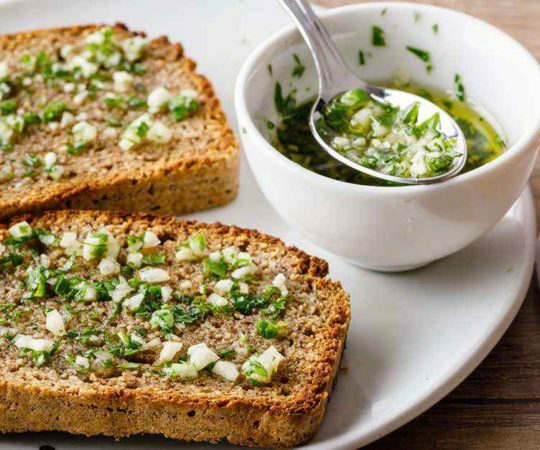 I made some similar to this, BUT, I highly recommend not mincing the garlic, but, using whole cloves or large chunks of garlic. It roasts up so nice and sweet and mild! A treat. Use lots. Not worth the boiling water step…just ship them directly to the oven. Same result. These sound delicious. Can’t wait to try them. Has anyone tried turmeric or curry with their Brussel sprouts??? Step 1 is totally not necessary, and boiling causes many nutrients to be wasted because they seep out into the water and are lost. Just start with Step 2 and roast in oven for 25-30 minutes. Easier, more nutritious, one less dish to wash, and yet just as delicious. Try with different spice combinations to match the rest of your meal. Why can’t u just fry the sprouts with the garlic ,cayenne pepper, & s & p,i in the 4tbsp of olive oil & sprinkle with lemon to serve. Seems a lot simpler. Viola, roasting veggies brings out a much richer flavor. I cooked a few cut up slices of bacon in a large oven-safe skillet. Used the bacon grease and adied a little oil to have enough. Cut the Brussel sprouts in half. Added the sprouts and all other ingredients as instructed to the oils and bacon. Placed skillet in oven and baked about 20 minutes along with my entrée (salmon). Added a little more salt and the lemon juice. I will definitely be making this again soon. 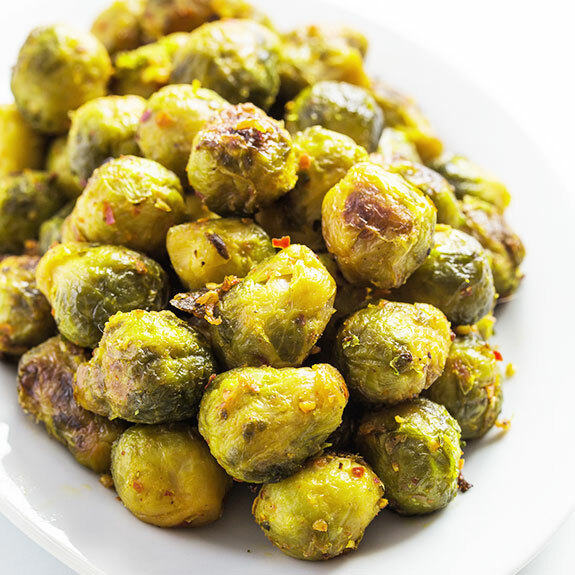 I love roasted Brussels sprouts and have tried them in many variations. 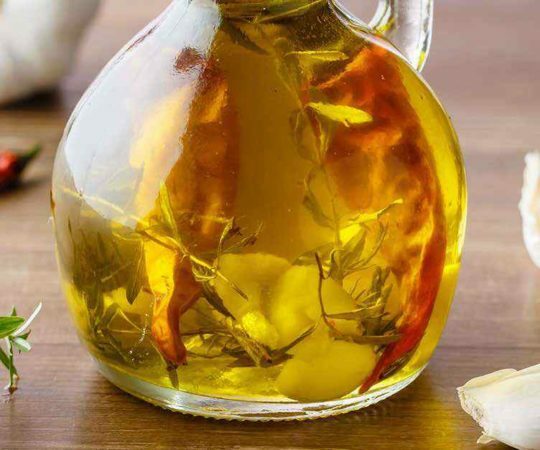 Once, I was dying for some and didn’t have any fresh garlic, so I used garlic oil instead of regular olive oil. It was fantastic. I only use garlic oil now. I also add parmesan, a touch of kosher salt and that’s it. Simple, clean and yummy. Try it! 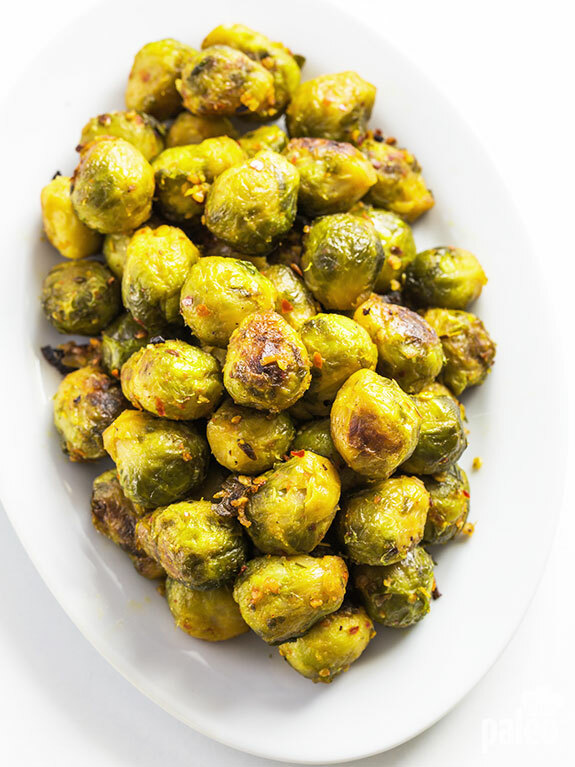 These are the best Brussels sprouts I ever tasted the cayenne powder is a must ! Delicious!!! I cut in half. Add onion flakes and sea salt. Bake 350 one side 20 minutes then toss around and bake another 20. I add. Honey mustard salad dressing before eating. Will try higher heat and boiling next time. crispy bacon and onion is really good with brussels sprouts…. I am out of oils in the house , can I use crisco in place of coconut or olive oil?